Current Market Analysis: Oklahoma was a territory until 1908. Anything issued before that date is called a territorial and is considered especially desirable. The one exception would be a 1902 red seal issued without the territorial status. The reality is that there are hundreds of scarce brown back, red seals, and blue seals from Oklahoma. The market is still generally strong, but it is down from the peak which was probably in 2011. 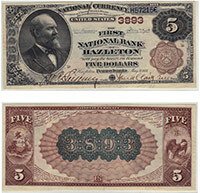 We generally advise that first charter notes are the best notes available from any state. However, Oklahoma didn’t have any banks that issued first charters. Virtually every town in Oklahoma was tiny when nationals were originally issued. A large supply of currency was not needed to meet the demand of these small communities. That is why so bank notes are so scarce today. We buy all antique paper money issued by The State National Bank of Shawnee, OK. We can tell you how much your $20 bill is worth. We aren’t just dealers. We are also collectors, experts, and appraisers. We have contributed to numerous price guides and are considered specialists in the field of national currency. Contact us via phone or email to get your free appraisal today.